Beyond our infamous mayor and the unusually long winter, hockey is always a part of our conversation in Toronto. Beyond the city having the Leafs and Marlies at the professional level (the Marlies offering an exciting brand of hockey both affordable and attainable), the city has the most outdoor rinks anywhere along with numerous recreational leagues. My wife plays in a women’s league (that’s her by the goalie) every Saturday night at Moss Park and I often bring my camera in tow. I get to wander around the rink and, at times, break a few “rules” slipping behind the bench for the only shots I can take that are not through glass. Everyone seems to appreciate that they can get photographs of themselves playing hockey. 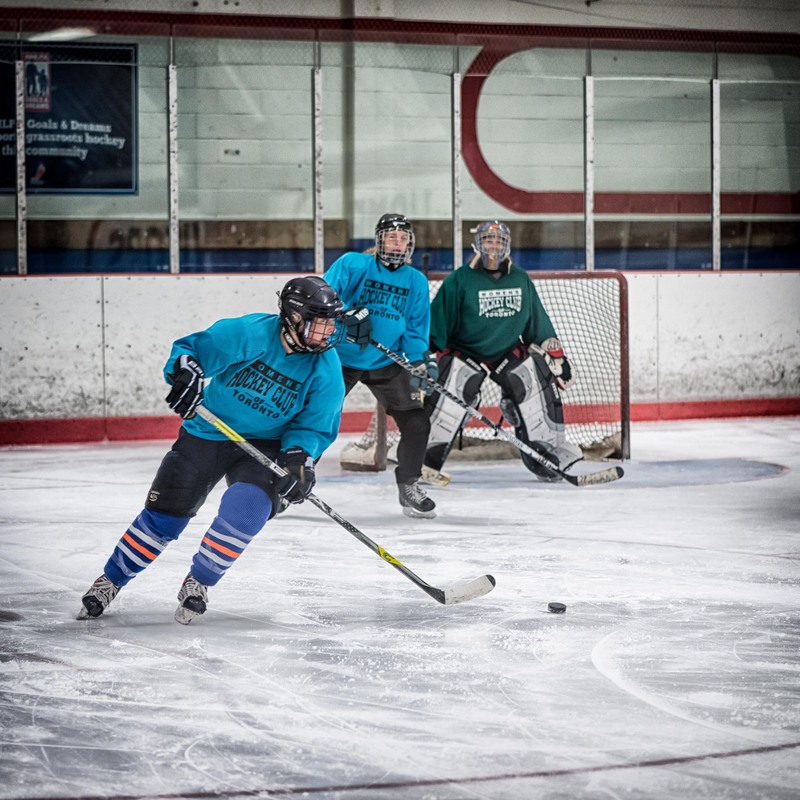 While I usually shoot in aperture priority, I shoot hockey in manual. The lighting doesn’t change in the rink so I don’t want my camera “fooled” when I zoom in or out, having more or less of all that white ice affecting the sensor. I try for a shutter speed of 1/125 but have to crank up the ISO if I’m using my 70-300mm f4.0-5.6 zoom. Lately I switched to the 105mm f2.8 to drop the ISO down and I find I’m not giving up too much. I’m no longer being lazy and trying to shoot the entire arena from one spot – now I focus on one area of the rink. I’m having some fun with the photos running them through NIK’s Color Effects (detail) to bring out some “grunge” in the photo. Being on the ice has a feel to it; a scent despite being made of odorless water. You can be tired but once you get on the ice and take a deep breath, you feel rejuvinated. I think this brings me closer to that feeling. This entry was posted in Sports Photography and tagged Hockey, NIK Software, photography, Skating, Toronto. Bookmark the permalink.